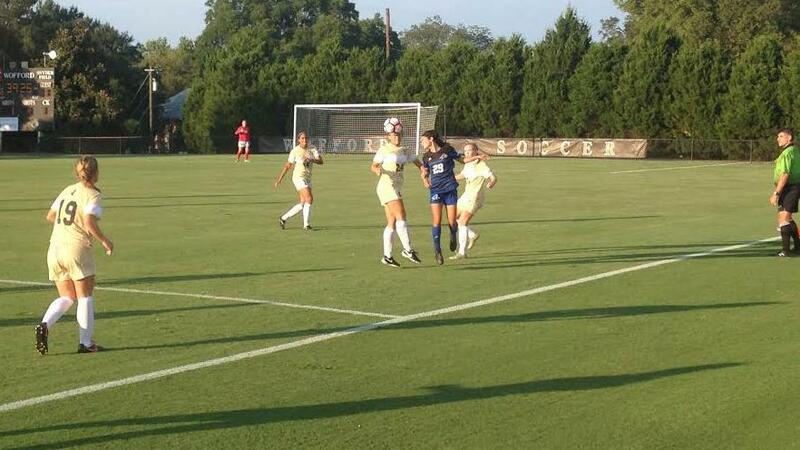 Bulldog forward Rachel Snyder heads the ball amid Wofford defenders. UNC Asheville women’s soccer team beat the Wofford Terriers Wednesday night with two goals from Ellie Stone, a 19-year-old sophomore biology student at UNCA. The team arrived in Spartanburg to face the Terriers with a 0-2 record and no goals in either of those matches. Wednesday’s match was scoreless all through the first half and mid way through the second. The Bulldogs kept the ball at the Terriers end for most of the match and created a lot of scoring opportunities finishing with 16 shots. The Bulldogs first goal came from a header by Stone off a corner in minute 70. Stone said the goal felt great being because it came so late in the match. “Having not scored all season, it was a great feeling finally getting one into the back of the net,” said Stone after the match. 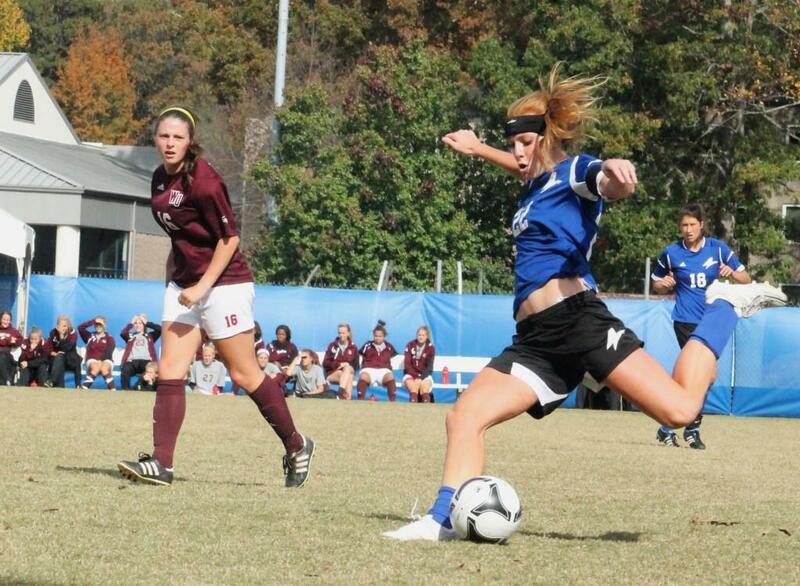 The Bulldogs earned another corner kick four minutes later in the match and Stone deflected the cross into the goal. Defensively, the team allowed few scoring opportunities for the Terriers, as highlighted by the Terriers mere three total corner kicks. The Bulldogs goalie Keller Dixon maintained a scoreless game until the very end with five saves, a few of which she made one on one against oncoming strikers. The shut-out lasted until minute 89 when the Terriers got past Asheville’s defensive line and scored a consolation goal. After the match, team captain Paige Trent, a 21-year-old psychology student said she is confident in the team’s abilities going forward. Head coach Michelle Demko said the win, coming off of two losses, reflected what the team is about and what it looks to accomplish as the season progresses. “The result of tonight’s game and how they played says a lot about their determination, character and team dignity. It was really fun to be apart of so going forward, the expectation is what we demonstrated tonight on the field,” Demko said. Trent said coach Demko has made a point of emphasizing performance at away matches.